Der Spiegel (The Mirror) magazine has a circulation of over 1 million and is published weekly and online. On April 8th 2011, journalist Carsten Volkery published his extensive, picture-led interview with Ajit Chambers. 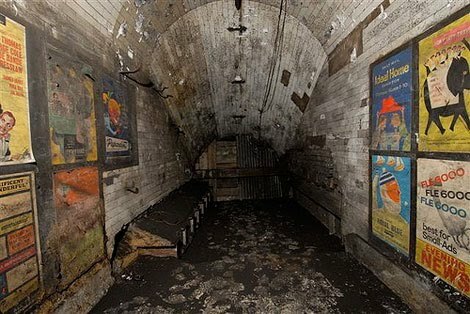 Volkery recounts how Chambers' discovery that there were 26 disused London Underground stations began with a quest to find an interesting location for a St Valentine's day event. That was two years ago, and today that initial quest has brought Chambers to the Mayor of London's office with a business plan to turn disused stations and other underground locations into money-making venues for arts, music and other projects, helping create much-needed investment and cash for the City itself. The Johannesburg-based Times Live, the online version of the South African Times and Sunday Times, carried a short report on April 9th in their Travel section. 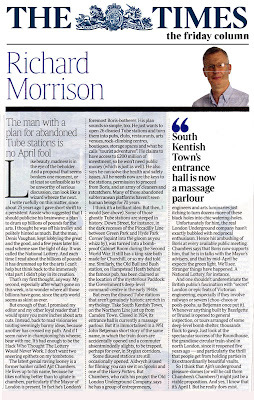 America's only national British monthly newspaper, distributed in every state, carried the story of The Old London Underground Company in Stewart Quentin Holmes' London Life column, on March 17th 2011. "Dozens of companies have approached Chambers to discuss renting the renovated spaces, including Kevin Spacey, the actor and Old Vic artistic director," writes Holmes. "And an entertainment group that wants to make an underground museum of a miniature Europe. Other requests were for places to stage theatre shows, weddings and conferences." "Underground stations lost beneath London's streets could be opened up again in an initiative to give them fresh life as concert venues, bars and tourist attractions..." writes Lewis Smith. "Ajit Chambers, the entrepreneur behind the scheme, believes the hidden stations and tunnel networks can be revitalised by allowing a range of businesses to move into them. Some would make use of the heritage value of such sites while others would simply make use of the unusual space." Sitting dormant and disused beneath the streets of London lies the City's largest asset, according to Ajit Chambers. The entrepreneur and former banker believes that thousands of square metres of abandoned underground locations could provide London with the plots which it so badly needs. Ajit Chambers is now in talks with Mayor of London, Boris Johnson, and various other government officials as he moves one step further to bringing his exciting plans to fruition. Katie-Jill Rowland speaks to Ajit Chambers, businessman and founder of The Old London Underground Company. The Times, Friday April 1st. 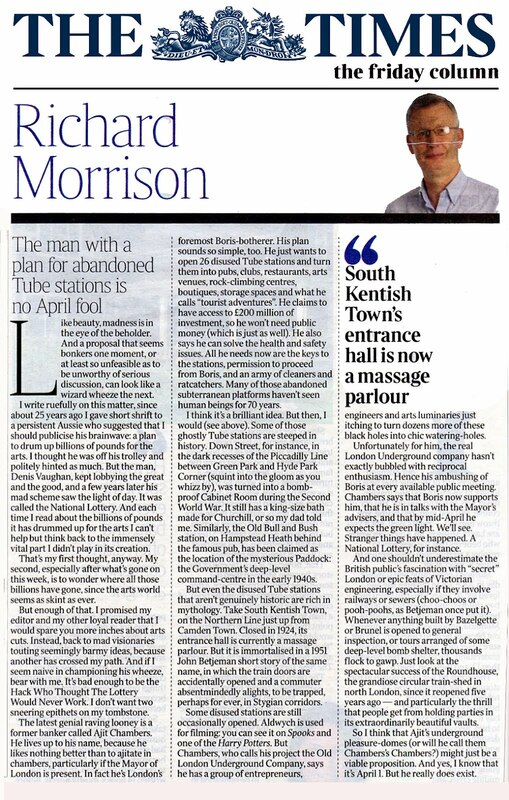 The man with a plan for abandoned Tube stations is no April Fool. "And one shouldn't underestimate the British public's fascination with "secret" London or epic feats of Victorian engineering, especially if they involve railways or sewers (choo-choos or pooh-poohs, as Betjeman once put it)."